** Swimming Pool heated over School Holidays!! Lowest Prices - Guaranteed. No Hidden Extras. No Booking fees, No Credit Card fees. Free Internet, Free Parking, Free Bike hire, Free Kayaks, Free Tennis. provide spacious, fully serviced nightly, or self-catering longer term, 2 bedroom luxury accommodation. children's playgrounds and frisbee golf course, all only minutes from Geelong's city centre. This truly is Geelong accommodation at its best. - something not usually associated with apartment accommodation. The grounds have been tastefully landscaped to blend in with the natural valley setting. whilst the children amuse themselves on our island adventure playground. are all close by (many within walking distance). 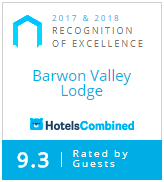 This makes Barwon Valley Lodge the Geelong accommodation of choice for so many. All You Need to Bring - is You!